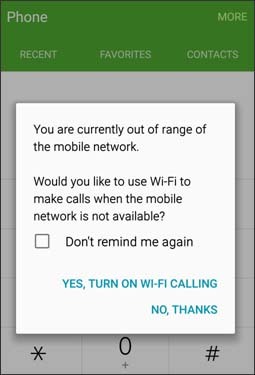 Devices with Android 8.0 or earlier can follow these steps to activate Wi-Fi Calling. Navigate: Apps icon > Settings > Advanced Calling. Navigate: Apps icon > Settings > More > Advanced Calling. Swipe up or down on the Home screen then navigate: Settings > Connections > Advanced Calling. 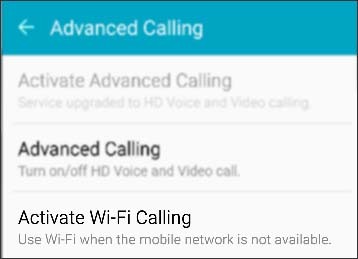 If you have downloaded the Package Disabler Pro app or a similar app, disable it if the Wi-Fi calling activation process has an error. After Wi-Fi calling is activated and working, re-enable the app for use. Power-cycle the device if not in the Verizon Wireless coverage area or traveling internationally. 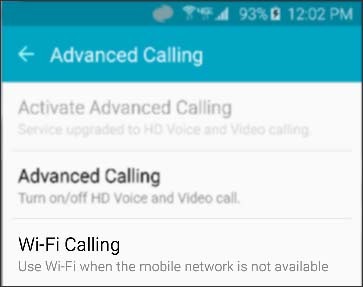 Devices with Android 9.0 can follow these steps to activate Wi-Fi Calling. Navigate: Phone Icon > More icon (upper-right) > Settings. Tap the Wi-Fi Calling switch to turn on or off.